Vacation rentals A Casa Battistini. 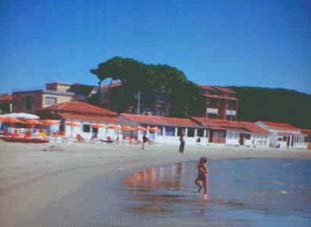 is located where the lush pine forest meets the shore of the Tirrenian Sea. The cottage can accommodate four people, and usually is rented for periods of one week (from Saturday to Saturday) and can also be rented for different lengths of stay, depending on the preferences of the guests. At Battistini vacation rentals Tuscany, we greet our guests with traditional Italian hospitality and above all, we take pride in our housekeeping services. 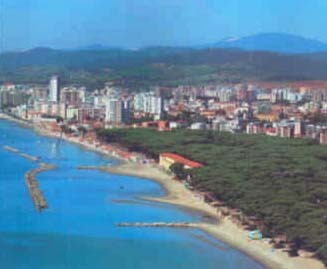 Follonica: the town and the huge pine forest. The beach front vacation cottage. A home facing the beach. The quaint Tuscany cottage, typical of early 1900's, has recently been restored. The house is directly on the beach and is a perfect way to relax. Its location is perfect for exploring nearby villages and regional art. The house is surrounded by pristine nature and pine trees. The sand is soft and golden ... and the beach is designated only for the residents. At Casa Battistini, sitting on the terrace, drinking good wine and watching the sunset, you can really meet the spirit of Italy. During your stay, you will enjoy the simple pleasures of life.